It was a family trip so i had to make compromises but got out 8 times in 2 weeks so pretty happy with that. Bought an AIRUSH HAMMER from Cape Sport Centre in Langebaan to the north of Cape Town – a decision prompted by a potential $200 charge to take my new quad surfboard on holiday. Board cost R4195 – about 320 quid – quite a saving on the 460 quid asking price in the UK. First day I tried it was on Laangebaan lagoon close to the shop I bought it from – flat water board planed early but no great shakes I thought. 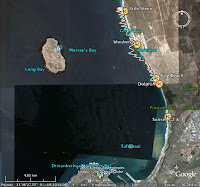 This is screen grab from GoogleEarth with the tracks from that first session 17.9 miles – get yourself a gps – Foretrex 201 on the wish list – great for recording tracks kitesurfing and mtb – and you can upload to googleEarth. Did my next trip at blouberg with it on then no more toy. Click picture for larger image. Then the next day went to Big Bay Blouberg – not a huge day by any counts but still clean head high waves coming through. Up on the board shot out popping over the white water then change direction onto a nice wave “Mmmmm this is smooth” – nice wave pealing to my left and I thought what the hell – instantly 3 or 4 perfect lip sections s lammed and dropped into the barrel so steeply that any other tt would have eaten it. 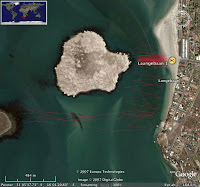 2nd session at blouberg 17.3 miles – looking at tracks you can see jumps on way out and then waveriding in ……. 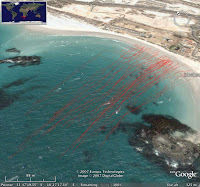 and lots of other kiters out on the Google Earth close up of blouberg – shame I couldn’t record altitude. (well it does but not very accurate for the relative short jumps …. Board shoots upwind – you can stall on wave waiting for it to build (the size insurance) – bow kites finally mean we are not squeezed onto small twintip to deal with power anymore, then as wave builds shoot down the line bashing it …. Board jumps great as well – might not have the pop of the flattest trickster tt but is the best all round board I have ever tried. Has replaced my Naish Alien 122 and Brunotti Wood 140 instantly and I am slightly scared that my surfboards might get less of an outing in the waves now that the little yellow devil is on the scene. If you can try it – you will probably buy it. ONLY downside – just my luck after 1st sail chucked my board onto beach and hit only stone there – put a small chip into gelcoat on nose – but this is probably a sacrificial tip and not structure specific – remedied straight away with a blob of some epoxy glue. …. I had forgotten that the world champs were taking place and his co car sharer was Ruben Lenten – .. Didn’t see either of them in action but saw that dutch teenage girl Sjouke something doing things that make you realise why I don’t enter competitions. Teamed up with some local boys in Cape Town and did a couple of downwinders (the most memorable being from Dolphin beach just downwind from Sunset to 3rde steen somewhere between Blouberg and Melkbos) – just massive jumps on the way out and waveriding in – for 15km down the coast. Guess we were doing about 45 – 60 km a day in about 3 hours of playing. Forgot how fantastic it was out there despite the cool current …. kited with one johnie (shark) a few dolphins, seals and penguins in a space of 3 days. Not many places where you get to do that. Needless to say my hands were shredded pretty quickly – it beats the rare weekend at troon. After all this playing packed up but time constraints (i.e. late) meant I didn’t get my VAT refund – a pisser an worth about 40 quid. But put the board back in a box and was all prepared to say it was art – but check in didn’t question my luggage – huzzah. courtesy of Dereck – if you like the look of this then visit his site. CLICK ! !